The issue of the strengthening or the weakening of democracy will be back on the policy agenda, in the European Union and in Israel. In Europe, the European elections will be an opportunity for a major democratic date which will make it possible to assess the progress of the lists feeding on the populist wave. In France, elements of the Yellow Vests seem willing to become part of the democratic game by presenting one or several lists of candidates for these elections. If that is the case, mostly if they succeed in mobilizing an electorate of stay-away voters, il will be undoubtedly an advantage for democracy. We should not draw hasty conclusions from these excesses: all Yellow Vests are not antisemites, not by a long shot, and many of them have often objected to the anti-Jewish statements and actions of a few elements. However, we should not turn a blind eye: the extreme-right influence groups are present in the different numbered “Acts” of the actual movement and Jews are not the only ones affected by these excesses. The reporting of illegal immigrants hidden in a truck, or the death threats against black deputies, show that racism and anti-immigrants hate are part of the protest movement. These extreme-right influence groups are not on their trial run. They have been invading for a long time the social networks, where racist, antisemitic or homophobic statements flourish in blogs and forums. Alain Soral’s websites (“Participative Democracy”) and many others are full of incitements to hatred. The novelty here is that hate takes to the street where it expresses iself with vehemence. We already heard, a few years ago, in an extreme-right parade, young people screaming “Jews, France does not belong to you”, but it could still pass as an isolated incident. Today, there can be no doubt: the phenomenon becomes widespread openly and publicly, shameless and unabashed. The President of the French Republic has condemned that hate in his New Year’s Greetings. He is not the only one to have done it: the medias, usually quite slow in condemning the antisemitism of numerous young Muslims, were quick to point that phenomenon. It is true that through their journalists, they were also victims of unacceptable agressions. 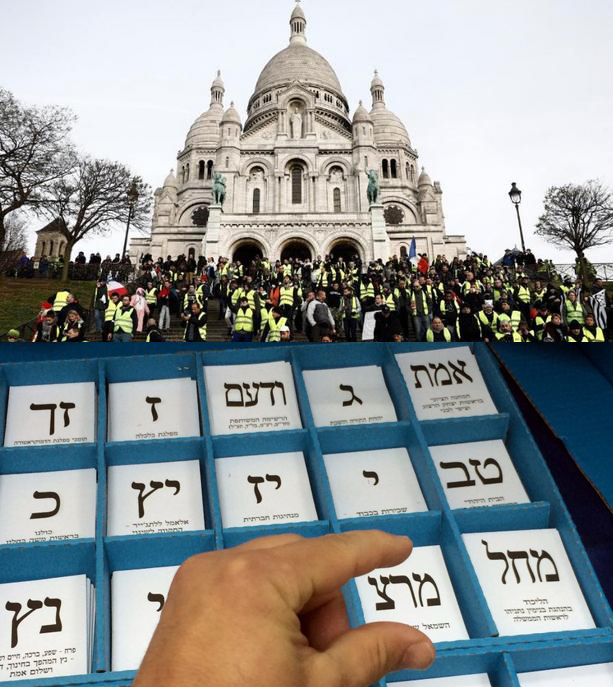 Facing these disquieting signs, French Jews have all reasons to worry. The extreme-right antisemitism had not disappeared, but had been pushed into the background, compared to the murderous antisemitism of Islamists, and that of numerous leftists, labelled as “anti-Zionism”. It has reappeared openly, bringing back very bad memories. The leaders of the Jewish community voice their concerns—without attacking the Yellow Vests Movement as a whole, which reflects a genuine social, territorial and political unease; mediatic and political condemnations pile up, but what else can we do ? The administration of justice becomes more efficient—Alain Soral was recently sentenced to one year in prison—, but is it enough ? France is expected to pass an act condemning hate on Internet similar to the law Germany enforced, sentencing to large fines the websites that broadcast such messages. Antisemitism is a threat against the Republic which must know how to defend itself and protect democratic achievements. In Israel the issue of democracy is also on the agenda—not in the sense of the expression of the popular will through the vote, but in the problem of ensuring compliance with the law.The day before his arrival in France, President Reuven Rivlin warned against a declining respect for the rule of law in Israel: “The respect for the rule of law has declined through the years”. The Israeli President took several times a stand against attempts to crack down on the Supreme Court; besides, he strongly denounced the Nation-State law, as being “bad for Israel and bad for the Jewish State”. In about two months, the legislative election will take place. According to persistent rumors, the Attorney General, Avishai Mandelblit, is about to indict Prime Minister Benyamin Netanyahu in at least one of the three cases of corruption in which he is involved. Such a decision, if it is taken, will be a key factor for the campaign, for the polls results, and for the possible scenarios of a post-election coalition. According to a recent opinion poll, the Likud would lose 4 deputees in the event of an indictment of Netanyahu, dropping from 29 to 25 deputees (out of a total number of 120 members of Parliament). It would still remain the most important Party represented in the Knesset, but the centrist lists Yesh Atid (“We Have a Future”), led by Yair Lapid, Hossen LeIsrael (“Impact Strength for Israel”), launched by Benny Gantz, ex Chief of General Staff of the IDF), would get 14 deputees each. Such a result would open the door to a possible centrist coalition with the Labour Party (which would get 9 seats according to the same poll) and other small lists. That scenario is very likely to happen since Moshe Kahlon, of the Kulanu Party, said he would not become part of a government led by a Prime Minister who would have been indicted. This is the reason why Netanyahu and his Ministers are currently attacking the Attorney General, accusing him of intending to affect the election results by his decision, and attacking as well the medias which would be, according to them, the initiators of the campaign against the Prime Minister. Violating the principle of the division of powers, on which are founded our liberal democracies, they claim that the people, instead of the judges, will decide of the Prime Minister’s fate by approving Netanyahu by a large majority, placing him above the law. Facing that threat, while centrist lists are multiplying—as well as rightist lists, with the New Right Party created by Naftali Bennett and Ayelet Shaked, who hope to take over part of the Likud electorate—a campaign is developing in the country, encouraged by known popular figures like Tsipi Livni, whose Party Tnua would not reach the minimum threshold level, and Ehud Barak, calling for a union of centrist and leftist lists in order to win the elections. It is still too early for such an appeal to be heard by these lists’s leaders, who are busy negotiating eligible positions with the well-known figures they wish to have on their side. But after the lists are submitted, around mid-February, will start a new stage of the campaign. And then, if these calls to union succeed in winning an increasing part of the public opinion—and mostly if Netanyahu is indicted— we may hope for a new dynamics to start. However, two months and a half are a long time in Israel, and we may expect many more surprises. We will then follow with an extreme attention this electoral campaign, and we will convey to you, on a regular basis, analyses and polls via our website. “Kahanists” have no place in the Knesset ! I agree and support !